Managed for hunting and fishing -- hiking permitted. Located between Stokes State Forest and the Delaware Gap National Recreation Area. Noted for its trout streams, the Flatbrook WMA contains 2,090 acres in two tracts. The Three Bridges area on Mountain Road within the Flatbrook-Roy Wildlife Management Area is closed to vehicular traffic indefiniately. The decision to close the road was made based on concerns form the Department of Transportation engineers regarding the structural integrity of the bridges. 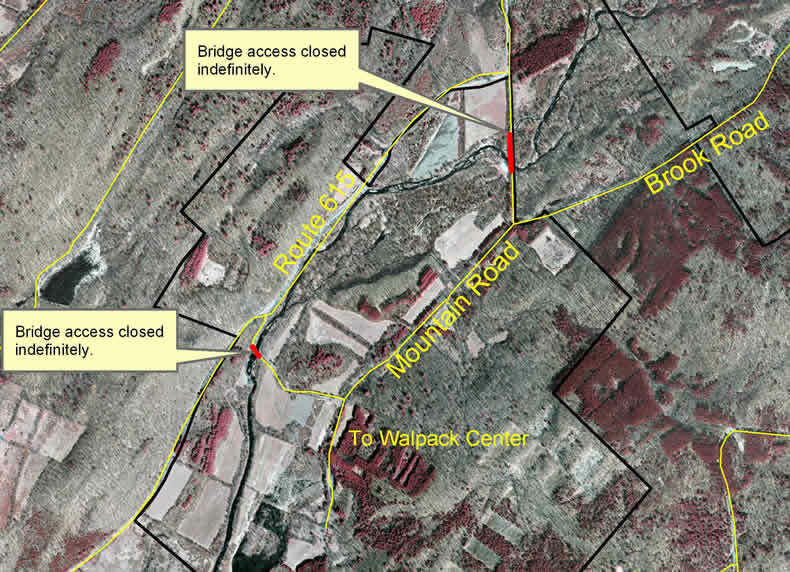 Hikers can still access this area via foot and can park along Mountain Road before the bridge closures, and can also use alternate routes via Brook Road from Route 560 or Mountain Road from Walpack Center (View Map). No marked trails. Use the Web Map link on this site for a NJ State Park trail map of Stokes State that incudes this WMA. This map from NJ Fish and Wildlife displays park boundaries and parking areas. In the Delaware River recreational area. Parking is available on a road leading east from County 615 [Kuhn Road], just north of Peters Valley Craft Center on County 615 about 0.2 mile east of the intersection with County 640.